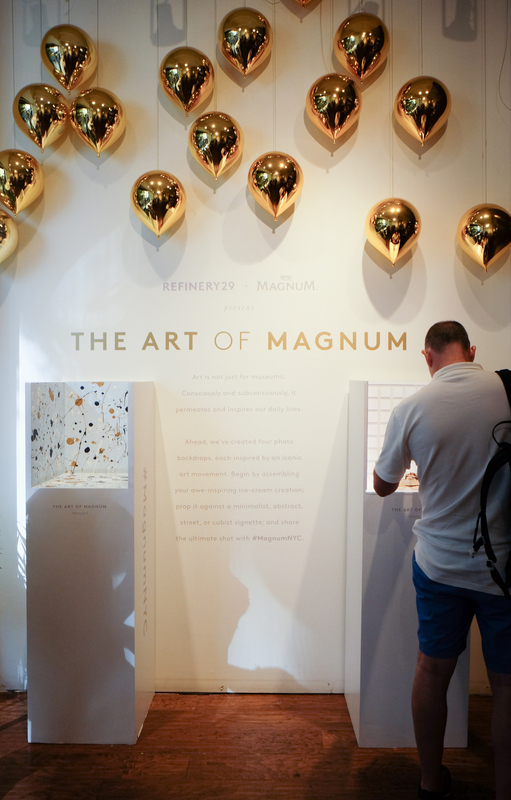 I had been hearing about the Magnum Ice Cream NYC Pop-Up Store for weeks. The Pop-UP was initially going to close at the beginning of August but now according to the Manager they will be open to at least mid-September. The day I went they had run out of chocolate pops but I found out I shouldn't be too bummed because last Sunday they ran out of all their ice cream. The shop is a social media dream. There are plenty of spaces and backdrops to photograph your creations. Magnum has even setup photo booths inspired by different artistic movements where you can snap the perfect Instagram photo. The staff is also really cool about being snap chatted and photographed while they customize your bar for you. Toppings range from crumbled cookies, chocolate balls, gold flakes, cereal & rose petals. Leaving many different flavor options and the opportunity for some pretty unique flavor combinations.